Depression Guideline Panel, Clinical Practice Guideline Number 5: Depression in Primary Care, 2: Treatment of Major Depression. Rockville, Md Agency for Health Care Policy and Research, Public Health Service, US Dept of Health and Human Services1993;AHCPR publication93-0551. Guy W ECDEU Assessment Manual for Psychopharmacology. Rockville, Md Alcohol, Drug Abuse, and Mental Health Administration, Public Health Service, US Dept of Health, Education, and Welfare1976;ADMpublication 76-338. Background Although various strategies have been proposed to treat antidepressant nonresponders, little controlled research has been published that examines prospectively the use of switching to an alternate antidepressant. Methods This was a multisite study in which outpatients with chronic major depression(with or without concurrent dysthymia), who failed to respond to 12 weeks of double-blind treatment with either sertraline hydrochloride (n = 117) or imipramine hydrochloride (n = 51), were crossed over or switched to 12 additional weeks of double-blind treatment with the alternate medication. Outcome measures included the 24-item Hamilton Rating Scale for Depression and the Clinical Global Impressions–Severity and Improvement scales. Results The switch from sertraline to imipramine (mean dosage, 221 mg/d) and from imipramine to sertraline (mean dosage, 163 mg/d) resulted in clinically and statistically significant improvements. The switch to sertraline treatment was associated with fewer adverse effect complaints and significantly less attrition owing to adverse effects. Although sertraline treatment also resulted in significantly higher response rates in the intent-to-treat samples (60% in the sertraline group and 44% in the imipramine group), neither the intent-to-treat remission rates nor the response and remission rates among study completers differed significantly. Moreover, after considering the effect of attrition, there were no significant treatment effects on the more comprehensive generalized estimating equation analyses of the continuous dependent measures. Conclusions More than 50% of chronically depressed antidepressant nonresponders benefited from a switch from imipramine to sertraline, or vice versa, despite a high degree of chronicity. As in the initial trial, sertraline was generally better tolerated than imipramine. Switching to a standard antidepressant of a different class is a useful treatment strategy for antidepressant nonresponders and could be considered a standard of comparison for future studies of novel alternate strategies. AT LEAST 40% of patients treated for depression do not respond to the initial trial of antidepressant medication.1 Thase and Rush2,3 characterized this as stage I antidepressant resistance, the first of a sequence of 5 stages defined by treatment history. Numerous treatment options are available for such individuals, including switching between or within classes of medications, as well as various augmentation strategies. In fact, the major issue facing clinicians is trying to decide which "next step" strategy to choose.3,4 Some clinicians favor augmentation strategies because of ease of implementation (eg, no tapering is needed), whereas others view switching to a different antidepressant, especially one from a different class, as a more prudent option.3 In an era in which selective serotonin reuptake inhibitors and tricyclic antidepressants are the most widely prescribed antidepressants,5-7 it is important to document the efficacy of each medication class, in sequence, when the other has failed. Despite the public health importance of antidepressant nonresponse, surprisingly few switch studies2,3 have been conducted. Only a handful have confirmed prospectively the adequacy of the ineffective medication trial or have used controlled, double-blind methods. We report herein the results of a large, double-blind study of patients with chronic forms of major depression who, after failing to respond to 12 weeks of double-blind treatment with sertraline hydrochloride or imipramine hydrochloride, were crossed over or switched to the alternate compound. This protocol was part of a multiphase, collaborative research program studying chronic depressive disorders. 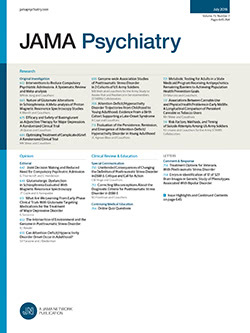 A full description of the study design, rationale, and methods has been previously published.8 Briefly, outpatients aged 21 to 65 years were eligible to enroll at 1 of 12 centers if they met DSM-III-R criteria for chronic major depressive disorder (ie, current major depressive episode of ≥2 years in duration) or "double depression" (ie, a current major depressive episode superimposed on an antecedent dysthymic disorder). The findings of the main study9-11 have been described elsewhere. Intake diagnoses were based on interviews using the Structured Clinical Interview for DSM-III-R12 and Structured Clinicial Interview for DSM-III-R Personality Disorders.13 Patients were excluded if they had organic mental syndromes, bipolar disorder or cyclothymia, schizophrenia or other psychotic disorder, obsessive compulsive disorder, or schizotypal, antisocial, or severe borderline personality disorder. Those with principal current diagnoses of panic, generalized anxiety, or posttraumatic stress disorders were also excluded. Patients were not eligible if they had abused alcohol or other drugs within 6 months or had experienced bulimia or anorexia nervosa within 1 year of intake. Patients considered to be an immediate suicide risk, to have medical contraindications to antidepressant therapy, or to have significant, unstable general medical disorders were also excluded. Patients who had not responded previously to minimally adequate trials of sertraline or imipramine(ie, at least 4 weeks of ≥50 mg of sertraline or ≥150 mg of imipramine daily) were ineligible. Patients could not have been treated with anxiolytic or other antidepressant medication within 2 weeks, monoamine oxidase inhibitors within 3 weeks, fluoxetine hydrochloride within 1 month, electroconvulsive therapy within 3 months, or depot neuroleptics within 6 months. Psychotherapy was permitted during the study only if it had been ongoing for at least 3 months before intake. All patients were seen initially for 6 weekly visits, followed by visits every other week for the balance of the 12-week trial. Imipramine was started at 50 mg/d and titrated by 50 mg/d per week, as tolerated, up to a maximum of 300 mg/d. Sertraline was also initiated at 50 mg/d, but a dosage increase was not permitted until the end of week 3. Thereafter, weekly increases of50 mg/d were possible, if indicated and tolerated, up to a maximum of 200 mg/d. Therefore, maximum dosages of either study drug could be reached by week 6. Patients who could not tolerate at least 50 mg/d of either study medication were withdrawn from the trial. Mean ± SD dosages of 141 ± 59 mg/d of sertraline and 200 ± 82 mg/d of imipramine were achieved at the end point of the initial acute-phase trial. Vital signs and adverse events (volunteered or observed) were assessed at each visit. The principal dependent measures, the CGI-I (Improvement) and the 24-item HAM-D, were obtained at each visit. Secondary measures included the CGI-S (Severity), Montgomery-Åsberg Depression Rating Scale,16 Cornell Dysthymia Scale,17 and self-report 21-item Beck Depression Inventory.18 All clinical ratings were completed by a blinded, independent evaluator. A satisfactory therapeutic response (hereafter referred to as response) was noted if the final CGI-I score was 1 or 2, there was at least a 50% reduction in total HAM-D score to a final score of 15 or lower, and the CGI-S score was 3 or lower (ie, the patient was no more than mildly ill). Patients not meeting these criteria were considered nonresponders. A full remission was defined as a final HAM-D score of 7 or lower and a CGI-I score of 2 or lower. Among the 635 randomized patients, 302 completed the 12-week acute-phase trial as responders (205 for sertraline and 97 for imipramine). Two hundred seven completed the study as nonresponders. One hundred twenty-six patients discontinued the study prematurely (76 in the sertraline-treated group and50 in the imipramine-treated group), of whom 22 patients were responders at the time of study discontinuation (15 in the sertraline-treated group and7 in the imipramine-treated group) and of whom 12 patients discontinued before the first evaluation after randomization (5 in the sertraline-treated group and 7 in the imipramine-treated group). There was no difference in response rates between treatments in the intent-to-treat samples (52% in the sertraline group and 51% in the imipramine group).10 Of the 311 nonresponders, attrition was significantly greater from imipramine(41% [43/105]) than sertraline (30% [61/206]) (χ21= 4.02, P = .045). Two hundred seven nonresponders completed the initial trial. The 62 imipramine nonresponders received a mean ± SD final dosage of 235 ±66 mg/d (range, 100-300 mg/d). The 145 sertraline nonresponders received a mean ± SD final dosage of 158 ± 57 mg/d (range, 50-200 mg/d). In both cases, nonresponders received significantly higher mean ± SD dosages than responders (205 sertraline responders: 144 ± 55 mg/d, F1,348 = 6.23, P = .01; 97 imipramine responders: 218 ± 72 mg/d, F1,157 = 4.30, P = .04). Nonresponders were tapered off study medication over 1 to 2 weeks, with the double blind maintained. After at least 1 week of not taking any study medications, patients who continued to meet nonresponse criteria and who gave renewed written informed consent were crossed over to the alternate medication. Visits, assessments, medication dosaging, and outcome definitions for the switch study followed the same protocol as that used in the initial acute-phase trial. Categorical analyses (eg, adverse effects, attrition, and response rates) were performed using Fisher exact probability test, simple χ2tests, McNemar test (for within-subject comparisons), or Cochran-Mantel-Haenszel χ2 test, as appropriate. The latter test was stratified by study site and depression subtype. All statistical tests used 2-tailed probability values, with unadjusted significance levels of P≤ .05. Response and remission rates are reported at the end point for the intent-to-treat sample and for study completers. The original data analysis plan called for analyses of covariance of the continuous dependent measures for the intent-to-treat sample, using the last observation carried forward method, and the completers sample. The availability of more sophisticated statistical methods, coupled with a significant, nonrandom difference in study completion rates, led us to pursue a different analytic strategy. Tabulated results of the more conventional analyses of covariance are available from one of us (M.E.T.). To combine information for continuous outcome measures from all patient visits in a single analysis, repeated-measures models were fit using generalized estimating equation (GEE) methods.19,20 An independent correlation model was assumed for the analyses reported herein. Separate GEE models were fit for each dependent measure, using data from all available visits and including main effects for medication group and week of treatment. Because missing data were not randomly dispersed (eg, virtually all missing data were the result of premature attrition, which was associated with poorer outcomes), we also included completion status as a main effect in the GEE analyses. Although repeated-measures analysis of such data could lead to biased results (ie, informative censoring), adjustment for completion status may partially reduce this risk.21z Score statistics based on GEE empirical SEs were used to quantify main effects and interaction terms (in the context of repeated-measures models), controlling for baseline severity, study site, and type of depression. Of the 207 nonresponders who completed the acute-phase trial, 168 (81%) began the alternate antidepressant. There were no significant differences in sociodemographic or clinical measures between those who did or did not participate in the second treatment trial. Reasons for not enrolling in the switch phase were not recorded systematically. However, several patients improved significantly during the washout period, and 1 patient experienced a significant clinical worsening necessitating emergency hospitalization. Fifty-one patients were switched from imipramine to sertraline, and117 sertraline nonresponders were switched to imipramine. These groups did not differ significantly on any relevant characteristic (Table 1). There was, however, a trend for women to be overrepresented in the group switched from imipramine to sertraline (78% vs 62%; χ21 = 3.50, P = .06). The mean ± SD dosages of imipramine and sertraline received at the end point of the second trial were 221 ± 84 mg/d and 163 ± 48 mg/d, respectively. Thirty-four patients dropped out, including 10% (5/51) of those switched to sertraline treatment and 25% (29/117) of those switched to imipramine treatment(χ21 = 4.94, P = .03). This difference was largely the result of a significantly greater number of patients discontinuing imipramine because of intolerable adverse effects (9% vs 0%; Fisher exact test, P = .04). Adverse effects reported during the first and second antidepressant trials are summarized in Table 2. Anticholinergic adverse effects, including dry mouth, constipation, and urinary complaints, were significantly more common in the group that switched to imipramine. There were also significantly more complaints of sweating, dizziness, and somnolence in the imipramine group. Diarrhea and insomnia were significantly more common among the group that switched to sertraline therapy. Other common adverse effects, including headache, nausea, fatigue, and sexual dysfunction, were comparable in both groups. Comparing adverse effect reports between the 2 treatment phases revealed that patients who switched from sertraline to imipramine experienced significant reductions in 3 adverse effects, but significant increases in 8 adverse effects(columns 2 through 4 of Table 2). In contrast, the switch from imipramine to sertraline resulted in statistically significant reductions in 7 adverse effects, but no significant increase in any adverse effect columns 5 through 7 of Table 2). Response status could not be determined for 1 patient. The sertraline intent-to-treat response rate was 60% (30/50), while the imipramine intent-to-treat response rate was 44% (52/117) (χ21 = 4.90, P = .03). Remission rates were 32% for sertraline and 23% for imipramine (χ21 = 2.28, P = .13). Among the 134 completers, response rates were 63% in the sertraline group and 55% in the imipramine group (χ21 = 1.96, P = .16). Remission rates also did not differ significantly among completers (35% for sertraline and 30% for imipramine; χ21 = 0.94, P = .33). Mean scores at baseline and end point and mean change scores for continuous clinical outcome measures are presented in Table 3. Results of the repeated-measures GEE analyses indicated that the patients in both treatment groups improved significantly across time, and completers improved significantly more than noncompleters on all measures. After averaging across the study weeks and adjusting for completion status, baseline value, site, and depression type, there were no significant differences between the medication groups for each outcome. In addition, when the effect of attrition was considered, there were no significant week-by-medication group interactions, indicating that the groups did not differ in their pattern of symptomatic improvement over time. This double-blind switch study provides further evidence that chronic depressions are responsive to antidepressant monotherapy after nonresponse to a vigorous 12-week initial trial. Overall, more than 50% of the patients who began treatment with a second antidepressant responded. These results are particularly noteworthy as the patients had a mean duration of more than6 years of continuous major depressive disorder. As in the initial trial,10 sertraline was significantly better tolerated than imipramine. The better tolerability of sertraline was reflected by a significantly lower attrition rate owing to adverse effects and a greater reduction in adverse effect burden following the switch to the alternate antidepressant. The difference in tolerability also helped to explain a significantly higher intent-to-treat response rate in the sertraline group, although a smaller difference in intent-to-treat remission rates was not statistically significant. Overall, we observed response rates that were similar to those in earlier published studies2,22-25 of switching across antidepressant classes. Response to the second medication was maximized in the present study by providing 12 weeks of pharmacotherapy(rather than the customary 4-6 weeks) and by permitting imipramine and sertraline dosages to be increased gradually, if tolerated, to the highest levels permitted within the manufacturers' therapeutic indications. Despite a favorable antidepressant response rate observed following the switch of antidepressants, low percentages of patients who began the second treatment trial (32% in the sertraline group and 23% in the imipramine group) achieved full remission. In other words, about one half of the responders had significant residual symptoms after 12 weeks of pharmacotherapy. Such patients are unlikely to have robust social recoveries,33 and they are at high risk for subsequent relapse.34,35 It is likely that patients with chronic depression warrant longer acute-phase trials. Indeed, 42% of the patients who responded but did not remit during the initial trial converted to full remission during continuation therapy.35 Evidence from another recent study36 of chronic depression suggests that the combination of psychotherapy and pharmacotherapy also increases the likelihood of remission. Our study has several methodological limitations that affect interpretation of the results. The first limitation is the lack of a placebo control group, which precludes more definitive assessment of the true magnitude of the treatment effects. We decided against using a placebo-controlled design because of concerns about withholding active treatment from chronically depressed antidepressant nonresponders. Most investigators studying treatment-resistant depression have made the same choice.3 However, placebo has been used in several studies29-31 of augmentation strategies, and nonspecific response rates of 10% to 20% are typically observed. Kocsis and colleagues37 similarly found a placebo response rate of only 13% in their study of imipramine as the initial treatment of chronic depression. If it is assumed that 20% of our patients would have responded to placebo, the effects of sertraline and imipramine would have been statistically significant. A second methodological problem is that switching the antidepressants of only the nonresponders is not representative of a true crossover design, which would require that responders also switch medications. Because the nonresponders are no longer necessarily representative of the initial randomized samples, we cannot rule out that the 2 switch groups differed in some meaningful way. Confidence in the validity of comparing these groups is strengthened by the lack of significant differences in the sociodemographic and clinical characteristics, as well as a virtual lack of predictors of differential response in the main trial.38 Nevertheless, without rerandomization of nonresponders to alternate treatments, our comparative results should be viewed as tentative. A third limitation is the exclusion of more complicated and comorbid patients from the main trial. Because such patients tend to be overrepresented among antidepressant nonresponders,1,2 the generalizability of our findings is somewhat attenuated. However, there is no reason to assume that excluded patients would have responded preferentially to one or the other of the study medications. Finally, it could be argued that the slower dose-titration schedule of imipramine during the first weeks of the protocol, while necessary, might have biased the results in favor of sertraline. However, because rapidity of response did not differ between the treatments and because all imipramine-treated patients received up to 6 weeks of therapy at maximal dosage, it is unlikely that speed of titration affected the final results. Faster titration of imipramine also may have exaggerated the tolerability problems observed with this medication. To our knowledge, this is the largest double-blind study of switching antidepressants conducted to date. Given the magnitude of the problem of antidepressant nonresponse and the large number of controlled studies of antidepressants under way at any given time, it is puzzling that switch designs are not used more widely. There is an impression that these studies are too difficult to conduct, because of perceived problems such as subject refusal, attrition, and inability to maintain the double blind. We experienced no such difficulties(eg, more than 80% of patients consented to the switch study), and our patients' outcomes were as good as those observed in the initial trial. Furthermore, the costs of a switch study are small compared with those of the parent trial. The public health importance of treatment-resistant depression provides a strong justification for broader use of the switch designs, which would facilitate the study of promising strategies for antidepressant nonresponders. The findings of this study illustrate the value of switching to an antidepressant of a different class after the failure of first-line pharmacotherapy. Switching nonresponders to an alternate antidepressant monotherapy is a straightforward strategy that could be considered an ethical standard of comparison for future studies of treatment-resistant depression. Submitted for publication November 3, 1998; final revision received October 19, 2001; accepted October 24, 2001. This multicenter research project was supported in part by a series of grants from Pfizer Inc. Corresponding author and reprints: Michael E. Thase, MD, Department of Psychiatry, University of Pittsburgh School of Medicine, Western Psychiatric Institute and Clinic, 3811 O'Hara St, Pittsburgh, PA 15213 (e-mail: thaseme@msx.upmc.edu).